- Place a single layer of eggs into pan. - Cover with cold water, about 2 inches above eggs. - Bring to a boil on high heat. - Remove from heat and let stand for 15 minutes. - Count out baggies by how many colors and drop 5 drops of food coloring into each baggie. - Remove eggs from water and place into a strainer. 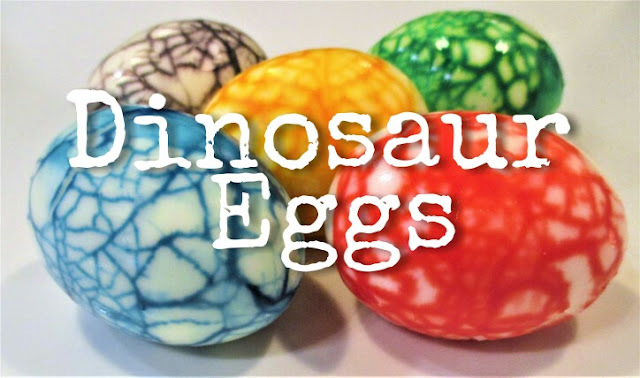 - Rinse eggs with cold water for about 1 minute. - Roll to crack shells, but do not peel. - Remove from baggie and peel under cold running water. This is what you get! Dino Eggs! Omg I can't wait to try this! My little girl loves eggs, but I bet she would be so excited to help me do this. We will be trying this tomorrow.